Bunch of grapes – try serving frozen! For extra profit, buy rice crackers when they’re on sale. 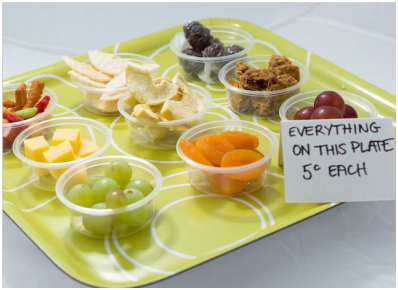 Display them on a tray at recess and dish out with tongs straight into students’ hands. It’s environmentally friendly and there are no packaging costs. Replace daily to keep fresh. 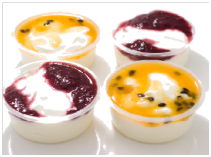 Yoghurts: buy reduced fat yoghurt in bulk and scoop out into plastic cups. Try adding 100% fruit puree on top. Raisin toast fingers: cut into three fingers and use a thin spread of polyunsaturated or monounsaturated margarine instead of butter or dairy spread. Garlic toast fingers: mix olive oil, minced garlic and chopped parsley. Brush onto wholemeal bread, cut into three fingers and lightly bake – very popular and highly profitable. Fruit bread pieces/apple scrolls: cut fruit bread, banana bread or un-iced fruit buns/apple scrolls and sell in snack-sized serves. Mini muffins: make or buy small, reduced fat, high fibre fruit muffins from a local bakery. 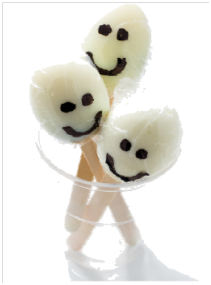 Googy Faces: shell hard boiled eggs, thread onto icy pole sticks (optional), wrap egg in cling wrap and draw smiley faces on the cling wrap with a permanent pen. Fruity Cones: serve four pieces of fresh fruit of varying colours in a square ice cream cone. Serve straightaway to stop the cone going soggy. Jelly Jumbles: jelly with canned fruit (in natural juice) or fresh fruit set in small plastic cups. Colour co-ordinating the fruit and jelly works really well! Strawberry Alohas: place strawberries on an icy pole stick, dip in low fat yoghurt, roll in coconut and freeze. Fruit juice ice cups: water down 100% fruit juice, pour into cups (250ml or smaller) and freeze – a great, profitable item. To jazz up the cups and for added nutritional punch, add diced fruit to the middle of the cup. Sticks ‘n’ Dip Combo: offer crunchy veggie stick combos in a clear cup with reduced fat dip in the bottom e.g. tzatziki, tomato salsa or hummus. Give this menu item a catchy name like ‘crunchy sticks’ or ‘sticks ‘n’ dip’. Corny Cobs: steam corn on the cob (buy frozen bulk bags). Offer flavourings like sweet chilli sauce, lemon juice or herbs. Nibble Mix: mix air-popped popcorn, breakfast cereal and dried fruit. Serve in bags or patty cases. Dried fruit ‘lolly’ jars: display dried fruit in large clear jars like in lolly shops. Serve a small amount straight into students’ hands. Dried fruit ‘lolly’ bags: serve dried fruit mix in bright ‘lolly’ bags. UFOs: canned pineapple rings in natural juice wrapped in cling wrap and frozen. Apple Slinkies: turn apples into fun slinkies with the apple slinky machine (appleslinky.com.au). If fresh fruit is not sold by the end of the day, wrap in cling wrap and freeze, serving frozen on another day. Frozen fruit can also be used in muffin recipes or smoothies.